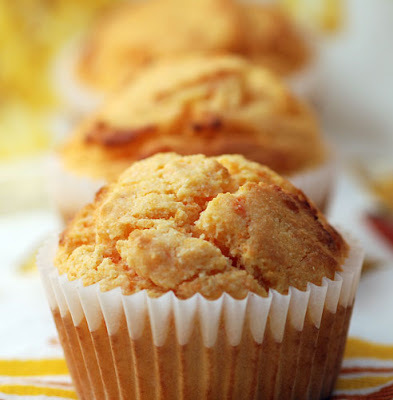 These muffins are a beautiful mango color with hints of both corn and sweet potato flavors. The original plan was to eat these with our sweet potato poblano soup, but the kids inhaled the muffins straight out of the oven. Good news since sweet potatoes are loaded with fiber, beta-carotene, vitamins A and C, and many important minerals including potassium, calcium and iron. We have therefore renamed these the "How to Trick Your Kids Into Eating Sweet Potato Muffins". They are so easy to make, a second batch was ready in a flash for the grown-ups. Preheat oven to 400° convection (425° conventional), place shelf in middle of oven. Line muffin pan with papers or butter well. Recipe makes 12 muffins. Pierce sweet potato several times and then cook in microwave until soft, about 12 minutes depending on how big your potato is. Remove skin and mash well with a fork, removing as many lumps as possible. Add butter immediately and mash again so butter melts into the potato. Combine dry in a large bowl. Combine egg and milk; mix well with a fork or whisk. Fill muffin pan and cook until baked through and browned on top, 19 minutes in our convection oven. Serve warm plain, with orange marmalade or whipped honey butter. For savory, serve with soup. Yum! 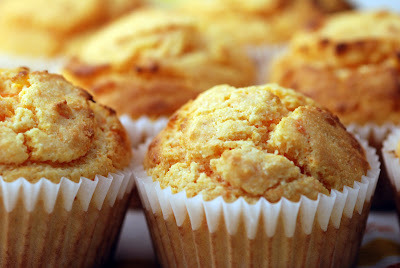 those muffins sound excellent with sweet potatoes & cornmeal! These look so great! What beautiful colors too. These are definitely hearty. Hope you are doing well Robin! Wow these look and sound soooo yummy!! Love the idea! Whoa, you certainly can't blame them for devouring them straight from the oven, they look far too tempting. Those look really good. Never heard about sweet potato corn muffins, but they sound good. I am definitely trying these. I have a feeling they would be a big hit in my house! The combination is brilliant and the color is just gorgeous. I want to know what it tastes like right now. How would pumpkin go w/ this instead of the sweet potato? I have so much extra pumpkin puree on hand and I need to use it!!! I've been wondering what to do about a stray sweet potato sitting in my fridge -- now I know. Thanks for posting this! This is a great recipe. I love sweet potatoes but my husband and son refuse to eat them. They both love corn muffins so this recipe should be a hit. I made these last night. I added 3 strips of cooked and chopped bacon and used the leftover bacon grease instead of oil (I NEVER do that, but apparently I was in an experimenting mood) and I added some chopped sage. I was cleaning out my fridge and that's why the random ingredients got throw in :) These are wonderful muffins. THANK YOU for the recipe.